Manatee County Mosquito Control District larvicides by both ground and air. Ground larviciding is usually accomplished with our spray trucks. 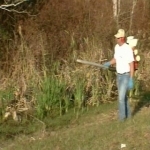 We spray roadside ditches and low lying areas which breed mosquitoes. Certain areas require different treatment such as with a backpack granular blower, handheld pump-up sprayer, or granular applications by hand in small areas. 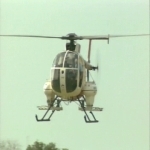 We also utilize our helicopters for larviciding applications. These missions occur during the daytime hours and are an attempt to prevent a future problem with adult mosquitoes. When larviciding we are generally applying a coarse spray (large droplets) of a chemical heavily diluted in water at a helicopter speed of 50 mph at extremely low altitudes. These droplets fall straight down into the target areas. 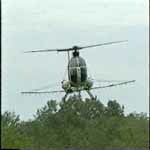 This method of spraying is used primarily in the coastal areas where very high concentrations of salt marsh mosquitoes are found and can be effectively controlled. The "freshwater" mosquitoes found in the eastern part of the county are not easily controlled through these methods. They are not typically concentrated in clearly definable areas or are in areas too vast to beeffectively treated in the limited time available (3-4 days).